Ransom: It seems like writers hardly ever have good or satisfying answers to the "where'd you get the idea for that" question, but in this case, I do! The pictures were the inspiration. I started collecting old photos a few years ago, and kept finding creepy old pictures of kids -- they kept me up at night, and I wanted to know more about who they were. But they were entirely divorced from their contexts, so I had to make up their stories myself. I approached my editor at Quirk Books with the photos, and we settled on the idea of weaving a story through the photos -- a novel. My first! I'm tempted to say the photos made the writing easy --- that's not quite true -- but they definitely helped my creative process. In the book, ‘peculiars’ are people with special abilities that defy logic. I can twist my arm all the way around--does that make me a peculiar? What are the signs of a peculiar child? R: In my imagining of it, "peculiarity" is a spectrum, kind of like the notion of disability. On one extreme you've got kids like Claire, who has a mouth in the back of her head. That's not exactly a special power -- and not terrible useful, except when it comes to biting people who are trying to sneak up behind you -- but it's awfully peculiar. Then you've got the kids who can make fire with their bare hands, or levitate, or are invisible. But even those abilities aren't entirely without disadvantages that make life a little difficult at times. I didn't want the peculiar children to be superheroes -- they're just different. So to answer your question, I don't know that there are any signs, at least not any that normal people could reliably recognize. Except one: they can enter time loops. Normal people can't do that. 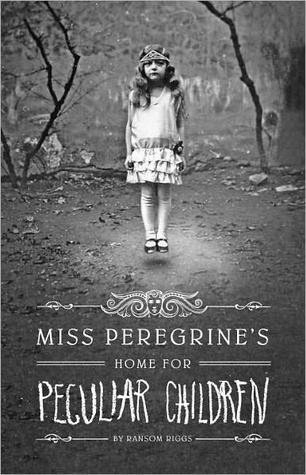 How exactly would you categorize Miss Peregrine’s Home for Peculiar Children? Paranormal? Historical? Just plain weird (but still totally cool)? R: I've never been one to read in any one genre exclusively, and I guess my writing style is a result of that; I just stick in whatever I think is interesting, whether it be historical or paranormal or romantical or just-plain-weird. I'm happy being unclassifiable! And lastly, describe the book in 3 words. There you have it! I definitely agree with the 'hashish head trip' description, haha! Miss Peregrine's Home for Peculiar Children was such a unique and amazing book, you should definitely check it out! Very interesting interview! Thank you for the poster giveaway! I'd love to enter, thanks for the giveaway! I just ordered this for my school library. I want to read it so I can book talk it but it looks kind of freaky (even in the trailer)! I honestly NEED this book it looks amazing!! Oh I always wanted a book poster! I would super duper love that poster because I super duper love that book!! Thank you for the opportunity! And if you're ever scouring the internet, I'm attempting to start my own book blog. It's very wip right now though. I LOVE the cover of this book and I can't wait to get a copy and read it!